Common file types like images, scripts, and stylesheets, are broken into subfolders in the page resources menu, which makes browsing through all of them simple enough, though the search feature is much faster if you know exactly what you’re looking for. 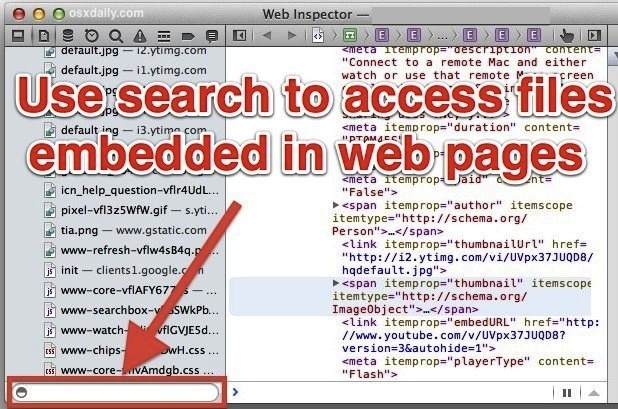 A few things to keep in mind here; in order to find FLV files accessible in the Resources search you must have the Flash plugin installed in Safari. Similarly, many audio files are accessible behind Flash players and also will require the Flash plugin to be installed before they load. You’ll also find that not all embedded files are shown with a file extension and they may not be returned in the generic search, if that’s the case you can typically locate them within the “Other” folder in page resources instead. am i being stupid? it doesn’t tell you how to download the files, just tells you to use developer menu to find. and then what?! 3. Click the url at the top of the screen and click option-return to save it. 7. imo 4-6 shows why mac is better. Unix>>DOS.